Despite objections by Sri Lanka’s Permanent Representative to the UN Tamara Kunanayakam of herself being transferred from her post, Sri Lanka’s ambassador to Belgium, Luxembourg and the EU Ravinatha Aryasinha has been appointed the new Permanent Representative to the UN, informed sources said. Ms. Kunanayakam will be sent as Ambassador to Cuba. Sri Lanka’s Deputy Head of Mission in Germany P.M. Amza will take up the post vacated by Aryasinha in Brussels. after mr.Jagath Dias.only Mrs.Tamara Kunanayakam fought against the tamil disapora and the UN in europe.she did a great job behalf of srilanka… therfore please leave her along and as i said after Mr. Jagath Dias she is the only person who treis to do the best job…thank you and god bless you Tamara. That’s the best news I have read for a long time in this hour of despair. Ravinatha was effective in his current post. He tackled the GSP issue brilliantly and also has kept the EU Parliament attacks on Sri Lanka’s integrity at bay. Best of luck Ravinatha. Tamara failed to deliver the Nation’s aspirations at the UN. She’s a miserable failure. Even in Cuba, she can mark time in the insiginificant posting. She can’t do much damage over there. This is a good lesson on the disaster of handing over State responsibility to tamil terrors. We simply do not know who they are wagging their tail to. How & Why such “objections” come from her…?! What’s the aim of her objections & why she wants to remain their…? This lady is a tamil terror. That is why I said “we don’t know who she is wagging her tail to”. 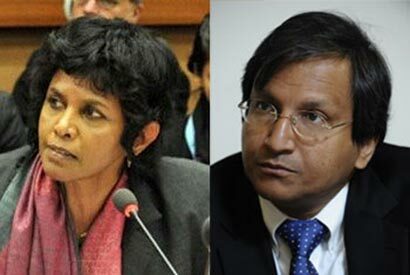 The decision to remove this tamil terror lady from Geneva is the best decision by Mahinda R and Sajin de Vaas G.
Gosl must act more strongly, straitly & decisively regarding such matters.. I listened and read the speeches of Tamara delivered in Geneva and other places against pressure from international community. She did it well in her best irrespective of being a Tamil as honorable Mr.Laxman Kadirgamar. Late Luxman Kadiragamar was a mess; he was unable to steer international opinion against tamil terror in Chandrika regime. All he was able to achieve was cut off some funding activities of tamil terror overseas. After all, we cannot expect much from a tamil terror; he was just another one of them. Bogollagama drove SL foreign policy at the height of the war and was able to keep international interference in internal affairs at bay. In the Mahinda Chinthanaya period where tamil terror was crushed and innocent civilians liberated, Bogollagama diplomacy was outstanding. The Peiris leadership in EAM has been substandard. SL foreign policy in the post tamil terror crushing period was ineffective until Sajin Vaas was made supervior of the EAM. Since taking over Sajin Vaas has driven foreign policy and performance to new heights ably supported by Kshenuka, the brilliant diplomat. I am not an expert in foreign policy but understood MrLaxman Kadirgamar did a good job irrespective of being a Tamil national finally compromising his life. Me I myself am very grateful for his work and I first time heard a mess his work. However, an external affairs minister happened to work in a limited frame and could not completely alone demoralize well established LTTE at the time.